Outlander – the TV phenomenon, and series of popular novels which has caused visitors to flock to Scotland, creating what is known as the ‘Outlander Effect’. Despite Outlander’s popularity, Jamie Fraser and co haven’t made an appearance in my blog yet. How can I call myself a Scottish blogger, when every other Scottish blogger (and their granny) published an Outlander themed blog long ago? Am I (shock, horror) an Outlander hater!? Far from it – I LOVE Outlander, and have been avidly watching since finding out what all the fuss was about as Season One of the TV series drew to a close. When Claire and Jamie were reunited in Season Three after spending 20 years apart, I was greetin’ like a big bairn (crying like a big baby, for those of you not fluent in the Scots tongue). So, I’m finally putting pen to paper to take you on a tour of some of my favourite Outlander filming locations in Scotland. Jamie’s ancestral home Lallybroch, or Midhope Castle as it’s actually known is located near the lovely village of Abercorn, 10 miles west of Edinburgh. That’s right, Lallybroch is nowhere near the Highlands! Despite the use of period props and CGI wizardry in the TV series, Midhope Castle looks exactly as Lallybroch should. It sits in the Hopetoun Estate, where the 18th century stately home, Hopetoun House is the jewel in the crown. Sadly, the 16th century tower house that is Jamie Fraser’s ancestral pile, is in a terrible state of repair and the interior is derelict. Yet, since Lallybroch started attracting visitors the Hopetoun Estate appear to have been milking it as a cash cow by installing a man in a shed outside to collect £5 from every car that arrives. For £5 you can spend a few minutes snapping some exterior shots before leaving – bargain! Let’s hope they decide to put the money to good use soon, and restore Midhope Castle to its former glory, before it’s lost forever. Despite my disdain for the way the site is managed and maintained, it’s a pretty spot and a must see Outlander filming location for fans visiting the area. Next, a fascinating historic site where you’ll be able to linger far longer than a few minutes. The formidable courtyard of Blackness Castle will be instantly recognisable to Outlander fans as Fort William from Season One. Unlike the real Fort William this site is a short hop from Edinburgh, and like Lallybroch it’s nowhere near the Scottish Highlands. 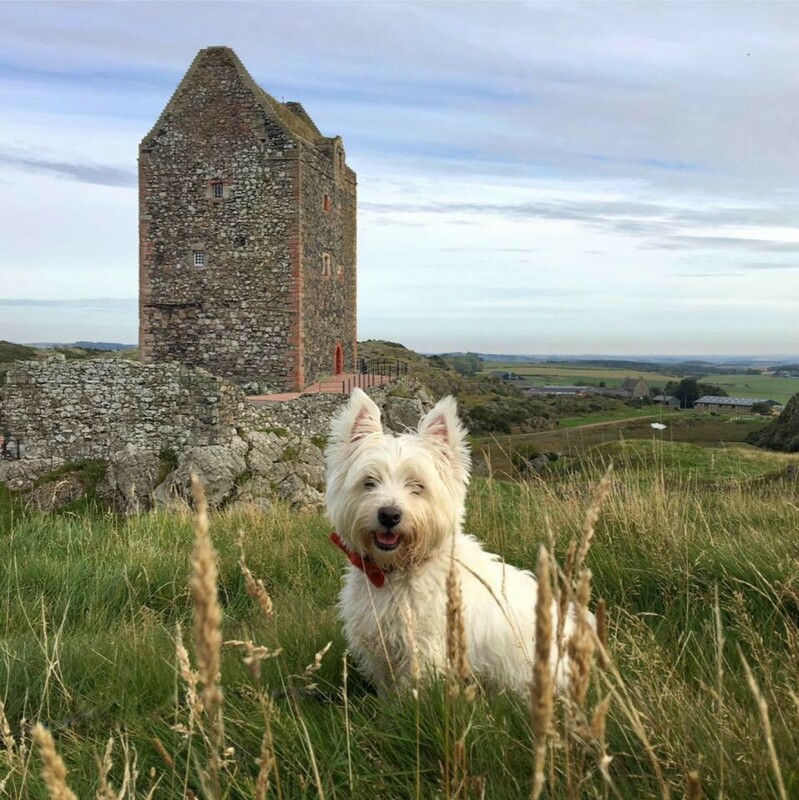 Blackness is a dog friendly castle, and The Wee White Dug had a great time exploring when he visited. I’ve always been a wee bit spooked by it myself, as it looks brooding and formidable. The 15th century fortress was built by the powerful Crichton family, and they called it home until it was seized by King James II. It later became a state prison, and will have witnessed real life deeds every bit as brutal as the beating Jamie received from arch-villain Randall. Blackness also boasts the obligatory castle ghost. A family who visited in the 1990s claim to have been chased from the castle tower by the ghost of an angry knight. If you do visit, make sure you’re wearing a pair of good running shoes just in case! Outlander filming location AND a resident ghost, what more reason do you need to visit? Culloden Battlefield or Drummossie Moor as it was known in 1746, lies 12 miles west of Mr G’s Highland hometown of Nairn. Nairn gets a mention in Outlander Season Two, as it’s where Cumberland The Butcher (The Duke of Cumberland) spent the eve of the battle, celebrating his 25th birthday. The next afternoon (16th April 1746) after less than an hour of fighting, around 1,500 Jacobite troops lay dead on the moor. Tired, hungry and ill-equipped they stood little chance against the larger, well-fed and well-equipped Government army. Not surprisingly Government casualties were light, with official figures reporting only 50 losses on the battlefield. The true figure was probably slightly higher. I’ve visited Culloden many times over the years – repeatedly drawn back to pay homage to the brave men who followed and fell. I find it a place of incredible sadness, but it also has a still, haunting beauty. The scattered stones marking the graves of the fallen Jacobites are a heartbreaking sight to see, and sometimes when I walk there a fat tear escapes and rolls down my cheek. With the gift of hindsight I know that what followed was every bit as brutal and devastating for the Highlanders as the battle itself. Although not used in filming, the ancient stone circles at Clava Cairns nearby are thought to have been the inspiration for Outlander author Diana Gabaldon’s, Craigh na Dun. Like Clava Cairns, the fictitious stone circle, Craigh na Dun is located near Inverness and contains a split stone. Clava Cairns have a real air of magic, and they’re definitely worth making a short detour to see if you plan on visiting Culloden Battlefield. If your heart’s desire is to meet a handsome Highlander like Jamie, touch the split stone and see what happens. And me, have I tried my luck with the stones? No need – I’ve already bagged a handsome Highlander of my own. Two if you count The Wee White Dug. And what of the most famous Outlander filming location of all. The ‘real’ Craigh na Dun? Well, you’ll find that on a farm in a remote corner of Perthshire – minus the time portal monoliths. Sadly, they’re just props. We pass Doune Castle frequently when we’re road-tripping, but rarely stop. Outlander fans will know it as the Clan MacKenzie stronghold, Castle Leoch which features frequently in Season One. Outlander isn’t this medieval castle’s only brush with fame – it also appears in the movie Monty Python and the Holy Grail and in the popular TV series Game of Thrones. Just like the filming locations for Lallybroch and Fort William, you won’t find Castle Leoch in the Highlands either. It’s located 8 miles west of Stirling. The real life MacKenzie Clan call Castle Leod near the Highland village of Strathpeffer home. Where they filmed ‘that’ ahem scene! Preston Mill on the outskirts of the picturesque East Lothian village of East Linton featured in a memorable scene from Outlander Season One. Pulses worldwide were set racing, when a naked Jamie was seen bathing in a stream by the mill, before having to hide from passing Government troops. You won’t find Jamie in the stream if you visit the historic mill, but you will find a beautiful village with some nice walks and great food. Also in East Lothian, you’ll find the actual battlefield where Charles Edward Stuart’s Jacobite army inflicted a surprise defeat on Sir John Cope’s Government forces in the Battle of Prestonpans. This site, which is reputed to have druid links, is one of the most eerie and strange places I’ve visited in Scotland. It’s probably also one of the most dangerous. The Liar’s Spring, which features in Outlander Season One is off the beaten-track, and you really need to know what you’re looking for to find it. There are two ways into this jaw-dropping gorge – both of them hair-raising. Several years ago I scrambled my way into the gorge with Mr G and the Wee White Dug. It’s possibly the closest I’ve ever come to breaking my neck for the sake of a photo. Slip sliding on mud, steep gradients and wading through freezing cold water are all required if you want to explore the place properly. Decent outdoor clothing and skills are essential. Was it worth it – hell yeah, it looked like something out of Jurassic Park and completely blew me away. Would I recommend a visit? No, it’s a dangerous place and not really suitable for visitors. Since Outlander fans started visiting the Liar’s Spring, there has been an increase in calls to the emergency services. People are getting into real difficulty in the gorge. So, unless it’s made safe for visitors, it’s best you avoid this Outlander filming location and visit some of the safer ones instead. There are many other Outlander filming locations I could have featured in this blog. Places I love to visit like Craigmillar Castle (Ardsmuir Prison, Season Three), the pretty Fife village of Culross (The village of Cranesmuir, home to Geillis Duncan, Season One) or Aberdour Castle (Sainte Anne de Beaupré’s monastery, Season One). I’m going to close with my favourite Outlander filming location – my gorgeous hometown of Edinburgh. When Outlander came to town to film Season Three, I wished that droughtlander (the period of time between two series) would hurry up and end. I was desperate to see my city on-screen. It was worth the wait. I may be a little biased, but I’d say Edinburgh stole the show. Edinburgh’s beautiful Old Town has been my favourite part of the city for as long as I can remember. I adore wandering up and down the historic closes, following in the footsteps of Edinburghers of old. Last week Mr G and I were enjoying a potter around the Old Town with the Wee White Dug (who was wowing tourists in a natty tartan waistcoat and bow tie combo) when I thought – wait a minute. I have a braw Highland dug here and he’s dressed to the nines. Hmmm, let’s head to Carfax Close (Bakehouse Close) and call on Mr Alexander Malcolm, Printer & Bookseller. Bakehouse Close is one of Edinburgh’s best preserved closes. Travelling down the dark, narrow passageway that leads from the High Street you emerge – slap, bang in the middle of Alexander Malcolm’s 18th century Edinburgh. The boy posed waited patiently on the steps, but Mr Malcolm didn’t appear – maybe next time. I hope you’ve enjoyed this whistle-stop tour of some of my favourite Outlander filming locations in Scotland. How cute is this dog? 🙂 Running a blog about film-inspired travel myself, I think this is a great take on tracing the Outlander Film Locations in Scotland! Thank you ☺️ – lots of fantastic film and tv locations in Scotland to cover. 😘 to your sweet dug. Thanks Samantha, I have been enjoying Outlander and seeing all the locations you mentioned. I really loved exploring the Highlands and Edinburgh and can’t wait to return one day. Vancouver Island seems so very far away. The wee man looks naked without a jacket or tie. Fab post and after tonight’s episode, we’re in for another droughtlander pause…. There are some fabulous locations and I am ashamed to say I have only visited a few! Shame on me! As for the man in the shed, I doubt very much he will be sitting there in minus 7, freezing his bits off! Lets hope they do something with it. Thanks Mel – I’ve not watched the final episode of Season Three yet as I want to savour it. Can’t believe it’s all over for another season. 😭 Most of these places I’ve passed while out pottering so the Outlander link is coincidental, but more and more as I travel these days I’m aware of places that have featured. At least we know Scotland will be back in Season Four – albeit disguised as the US or Caribbean I guess. I think man in shed is gone from Lallybroch. Apparently there’s been a rethink of strategy and they’ve installed a donations box which they empty daily. Thanks for a great tour and magical photos. Now I’m off to see what Outlander is all about! Fabulous! What a great trip. And, of course, where do I want to go after reading this? The Liar’s Spring! It will have to wait until I get off these crutches, but what an awesome place. As all of the places that you featured are. Thanks for a great tour. I have to tell you that I have never watched Outlander. I am led to understand from people who know these things that this is tantamount to admitting that I have never watched Game of Thrones. That aside, I enjoyed the post and the photographs even if I did not understand their significance to the the program. Although, having said that, any photograph with the Wee White Dug in it is a good photograph. I was sad to see Culloden again. I stood at the Cairn and wandered around the battlefield many times since I was first taken there fifty years ago. I spent a fair amount of time in and around Inverness and I eventually took my new wife there. As a Nairn man Mr.G. may know of the company I worked for then – Highland Haulage. As I said I enjoyed the post and the photographs, even if their significance was lost on me. Thanks very much for the tour Samantha,Is there an Outlander trail for tourists? Thanks Samantha and wee white for a tour of my favourite Outlander locations! Love the show! Thank you for the wonderful little tour of some of the Outlander sites. Must say though that ‘Wee White Dug’ looked like he didn’t want to spend too much time at Blackness Castle. Makes one wonder what they really sense of the history in these places. A family friend gives Outlander tours… Carnegie Tours. :-) They met because Dumferline is the sister city of the U.S. town I was born and raised in, and one of my father’s architectural projects was the Asolo Theatre that now houses the interior of the Dumferline Opera Theatre. Their favourite restaurant in Florida, Sunrise Cafe, is also run by Scots, and one of the owners remembers going to that theatre when It was movie house (as a kid). I love that they saved the theatre interior and moved it to the US. It must be odd visiting somewhere you went as a child, that’s now hundreds of miles away from where it once was. I know, right? At least it was saved. I miss the Sunrise Cafe, and our friends there that became like family. Wonderful post, again Sam! I so love the stunning photos of Clava Cairns, and your Wee Man in Old Town! Thanks Davena – the boy loves a good potter round the Old Town. I think it’s all the different smells he picks up. Thanks Dawn-Marie – Blackness, the name suits it perfectly. Glad I’m not the only one a wee bit freaked out by it. The charge at Midhope is ridiculous, and the man in the shed is grumpy and unwelcoming. He was annoyed when we arrived on foot, snapped photos and left. £5 for no toilets, no access inside and not even somewhere to grab a hot coffee – it’s robbery. I think they’ve just installed a donations box which I have no objection to, as long as the man in the shed is gone and the money goes toward restoring the castle. It’s appalling that a big estate like that would allow it to become derelict, given that it was still lived in, in the 20th century. That’s awful, a donations box sounds much better and I’m sure most people would love to see it restored. Imagine staying or dining in Lallybroch 😍 So much potential!